Creating a WordPress website does not require in-depth knowledge in the field of web design and development. At the beginning you only need to know how to create content and add it to WordPress. After building your first website and organizing the content into menu and categories you can easily outline the website’s structure and appearance. Publishing the first page on your website. Your website needs a name on the web as well as a hosting account. Along with the WordPress hosting you can also buy a domain name for your website. You already have WordPress installed? In case you are using the WordPress hosting service, skip the first step since you already have WP pre-installed. From now on you only need to visit the admin panel and create your first web page. Once you have a hosting account and a domain, log into the hosting cPanel. You can log into the cPanel through your customer profile on superhosting.bg under Hosting Accounts menu » Details » Login cPanel. WP installation into the hosting account is automatically performed through cPanel. With no files uploaded or databases created, the installation takes just a few clicks with the special SuperTool WordPress Manager. 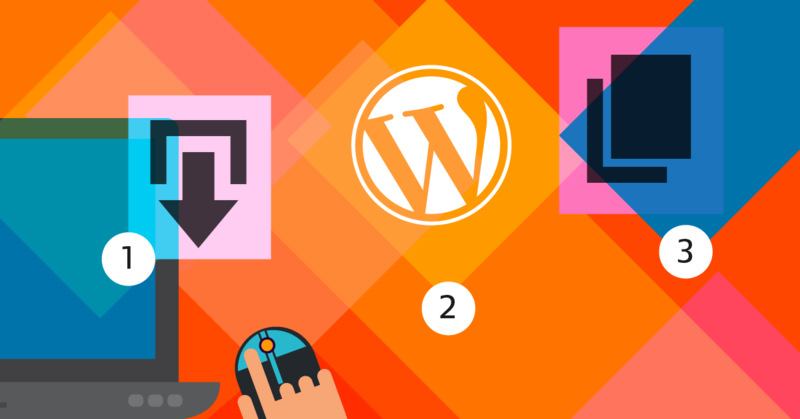 You can install WP through WordPress Manager » New WordPress installation. The installation requires some main data: You need to choose the https:// Protocol in order to secure the connection between the user and the website. The connection is secured via an SSL certificate installed in the hosting account. From the Domain drop-down menu you can select the website’s domain. Leave the Installation in Directory field empty, unless you want your website to be loaded with the name of a directory at the end, e.g. https://supercoolwp.com/directory. The website’s name and description are important but you can change them any time after the installation is finished. If you are still hesitating about the name, you can enter something close to the website’s idea. The website’s language can also be changed after the installation. Admin credentials are required for accessing the website's admin panel. Admin credentials comprise of a username and an email address plus a password. Choose a username and enter a strong password. You can change these once the installation is completed. Enter an administrative email address where you will receive system messages in relation to the website’s support and management. There are also advanced options for the system settings such as database name, username and password as well as table prefix in the database. If you are not sure about their purpose, you do not have to modify them. Select the first theme from the suggested ones as you can change it after the installation. Publish some content on the website so that you can see how it looks with the different themes. Finish your installation by clicking Install. After completion, you will receive a confirmation email containing URLs for accessing your website and its admin panel. Now you have a brand new website with the name of your business or idea. You can load it and look through it. There is sample content added by default - a category, a page, a post and one comment. To change what is displayed, you need to log into the admin panel. All you need to do or change with the website is performed through the admin panel. For quick and easy access you might bookmark its URL. When the website is loaded, you need to enter the username and password to access the admin panel. Those credentials are set up during the installation. 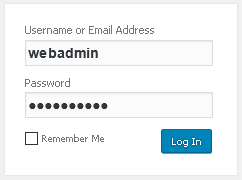 In case you've forgotten your password, access WordPress Manager » Administrative Data and set up a new one. On the webpage for accessing the admin panel instead of the username you can use the email address for administrative purposes, specified upon installation. The administrative panel has a Dashboard displayed right after your login, as it enables you to see the actions performed such as recently added articles, pages, comments. From the admin panel you can perform changes or set features. Use the option Website preview or Visit site to view your changes. You can keep the admin panel open in a tab and the website open in another. To open the website click on its name on the upper left corner of the admin panel or just load it in a new tab. To return to the admin panel use the Dashboard menu. It would be most convenient if you open the admin panel and the website in separate tabs and only refresh the website after performing a change from the admin panel. 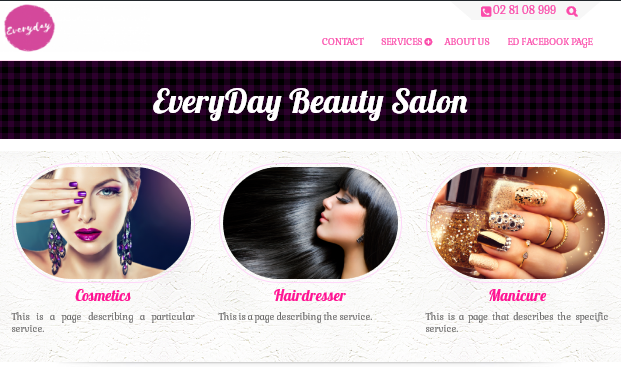 The main options to start with are Pages and Appearance » Menus. Tip: Since the website is already accessible on the web but not yet ready for the wide audience you can temporarily restrict search engines from indexing it. For this purpose enable the Discourage search engines from indexing this site option under Settings » Reading. Once the website is complete, you can disable this option. Before starting to change the website’s appearance, create a few pages and organize them into a primary menu. For the time being the website does not have a lot of content, only but a webpage, a category and an article with a comment. Basic containers which hold information in WordPress are Pages and Posts (Articles). The main ways to organize this information are: hierarchically ordering pages and subpages into Categories sorted by Tags and into Menus. Posts can be organized into categories and tags as well as used for publishing news, help articles or others. Pages are the fundamentals needed for every website as they contain standalone information which is not organized into categories or with tags. Some of the pages of a typical website most often are: Contacts, Services, About us, Blog (News), Gallery. The pages are usually items of the website menu. You first need to create a page and then add it into the primary menu. We will first start with the About us page. It is a clever way to present your business (or idea) on the website. On this page you can present to the visitors the services you offer as well as the opportunities, the quality and aims of your business. You can also explain why users have to choose exactly you. The About us page is an important part of your website. To create this page, you need to access Pages and then Add New. Enter a name of the page and fill in content into the Visual Editor. The Code Editor enables you to change the content's code, e.g. to add CSS. The page might contain not only text, but also various images, video or audio (Add Media button). Add featured image for the page in Page Image (from the panel on the right). This image is featured and presents the page's content. It is often used by the theme for displaying the head of the page. 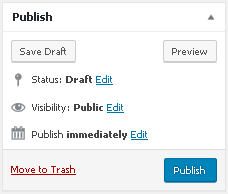 Publish the page by clicking Publish. Tip: The page URL is displayed below its name (Permalink) and now it is probably not looking in the best possible way. You might need to change the initial URL settings so that they are generated into a comprehensible format (friendly URLs). Click Change URLs right next to the URL and the setup page for permalinks will load in a new tab (Settings » Permalinks). There are a few types of custom URL structures, but to make them based on the page name, enable the option Post Name. This option is also valid for the page URLs. 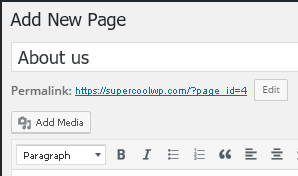 The URLs will be automatically generated and appear in the following way: https://supercoolwp.com/about-us, вместо https://supercoolwp.com/?page_id=4. Create a few more pages such as Home, Services, Gallery and News which can be completed on a later stage, but now will be used for the menu. The Home page might be also a front page. 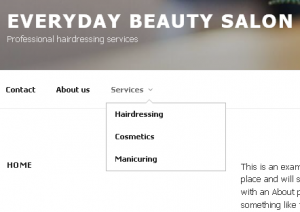 On the Services page you can add all the services you offer as separate subpages. In Gallery you can upload a few high resolution photos in a suitable format and size. You can use the News (or Blog) page to publish articles or posts. Publishing a page is not enough for it to be displayed on the website. You first need to select where exactly it is going to be displayed - on the menu as a home page or something else. After one or a few pages are published, it is easy to sort them into a menu from Appearance » Menus. The primary menu of each theme might be located differently. Enter a menu name such as main as it will be the primary website menu. Click on Create a New Menu as afterwards you will be able to fill it with items. Select the About us page from the panel on the left and click Add to Menu. If the theme supports a primary menu, in Menu Settings on the right below the items will be able to select the menu's location. For the TwentySeventeen theme the primary menu's location is named Top Menu. Select Top Menu and save it by clicking on Save Menu. The menu might contain pages, posts, categories and custom links. When the items are more than one, you can reorder or change the menu's hierarchical structure. You can also check where and how the menu appeared on the website. Currently your website's appearance might not fully meet your expectations, but this is only a default theme which you can later change. Here comes the entertaining part when you develop your own website. The way it will look, what elements it will have and where they are going to be located, the categories, menus, pages and others. The website's appearance can be changed by choosing another theme or using widgets. Adding features can be performed via plugins. 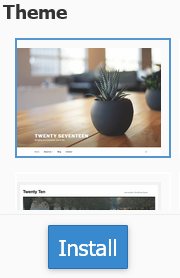 You can find free or premium themes and plugins in the WordPress.org directories. Premium themes and plugins offer the advantage of full support by their developers. Once you generate the website's content, you can easily experiment with its structure and appearance by testing the WordPress themes. The theme can be changed through » Appearance » Themes: Activated theme » Add new. 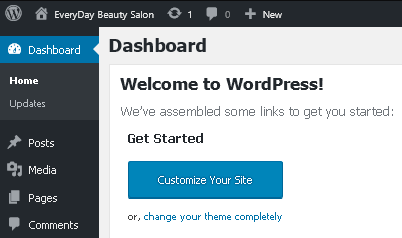 Since the theme is located in the directory with free themes, you need to select WordPress.org themes and type Beauty and Spa in the search box. There is a contact number entered upon the BEAUTY AND SPA OPTIONS. The website's title is entered in the Front Page Heading option. Under the Front Page Featured Boxes option three pages are selected to be displayed on the home page's three boxes (Cosmetics, Hairdressing and Manicuring). There is a Page Image set in advance so that it is displayed in the box. Under Site Identity you can upload your business’ logo. Under Website Settings a Static Webpage – Home has been set by default and the page set up for posts is News. A Tip for Beginners: Do not change the theme's files, but clone it instead to a child theme and make your modifications there. In case you modify the theme directly and then it upgrades, all changes will be lost. The next steps of your website's development are to preview and select a theme, set up widgets, tune WordPress and add different functionalities via plugins. Once you complete these, you can speed up your website and improve its performance. Enter your details in the Contacts page. But before that set up a few email addresses containing your website's domain to show more professional attitude towards your business such as: office@supercoolwp.com. Your website is already accessible on the web and to everyone who types its name in their browser's address bar. However, to be found on Google you will need to expand your reach a bit. You will need to submit your website to search engine and directories or directly set up an account in Google Search Console. Last, but not least, your website's security is crucial and directly related to your name and your web presence. Use complex and strong passwords as well as unconventional usernames. Activate all possible security mechanisms for your website such as protecting the directories and system functionalities. With WordPress you have full freedom to develop your own website by yourself. However, if you want it to be professionally developed and supported, you can always look for assistance and trust experts in this field.